I’ve tried to imagine growing up as the child of a baseball star. The riches and the famous family friends? Nah, too easy. What’s mind-blowing is the idea that the mailbox would be filled with letters from strangers. That’s what prompted me to send questions to Vernona Gomez, daughter of baseball Hall of Famer Vernon “Lefty” Gomez and the co-author of Lefty: An American Odyssey. Q: How did your Dad feel about fans and autographs? What versions of his autograph did you see? A: Lefty enjoyed the fans and signing autographs. 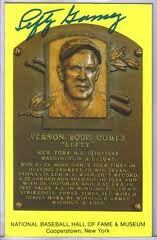 He signed as ‘Vernon Lefty Gomez’ and ‘Lefty’ Gomez, but not as ‘El Goofo’ — not his name. Lefty read fan mail and autographed fan mail for free. I have read many of his fan mail. Q: Do you sign autographs, such as your book? A: Yes. I am doing book signings for Lefty, An American Odyssey, across the nation. As an author, I’m happy to sign the Lefty book and only the Lefty book at the book signings. Q: Have you ever signed the Hall of Fame plaque postcard featuring your Dad? A: No, I do not sign Lefty Gomez’s Hall of Fame cards. His induction is based on his accomplishments in baseball. Only Lefty should sign the card. Coming Wednesday: Where and how to get those cool HOF postcards.